Are you new to ALDI? Here are some answers to Frequently Asked Questions about ALDI to help you get started. ALDI is a discount grocery store chain that is consistently ranked the top choice for low grocery prices in national consumer polls. They currently operate almost 1600 stores in 35 states, employ over 25,000 people, and have been expanding rapidly. ALDI has also been remodeling existing stores; in early 2017, ALDI announced a $1.6 billion investment to remodel and expand more than 1300 U.S. stores by 2020. Does ALDI take credit cards? ALDI started accepting all four major credit cards (Visa, MasterCard, AmEx, and Discover) in March 2016. Previously they had only accepted cash, debit, EBT, and Link; so if you see someone saying ALDI doesn’t take credit cards, that information is outdated. How does ALDI keep prices low? ALDI keeps prices low in a number of ways. ALDI sells mainly its own brands. About 90% of the products you’ll find at ALDI are private label rather than national brands, so you’re not paying the markup for national brand recognition or for their advertising costs. ALDI controls the production of its own brands, allowing them to do things like place multiple barcodes on most products for quicker scanning. 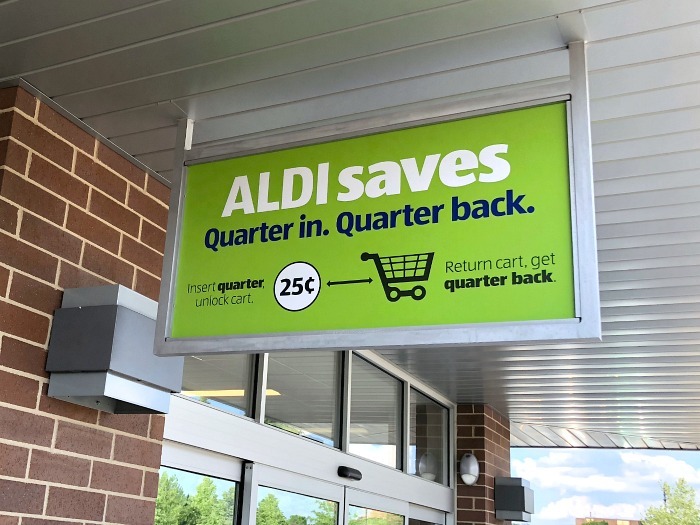 Practices such as having customers bring their own bags and bag their own groceries, stocking items in the boxes they come in, and renting carts allow ALDI to save on labor costs. Keeping stores small reduces overhead. ALDI has limited shopping hours. This will vary by store (check hours at your own ALDI location here), but run 9AM-9PM at my own local ALDI, for instance. Do I have to pay for a cart? You don’t pay for a cart at ALDI; you rent a cart at ALDI. 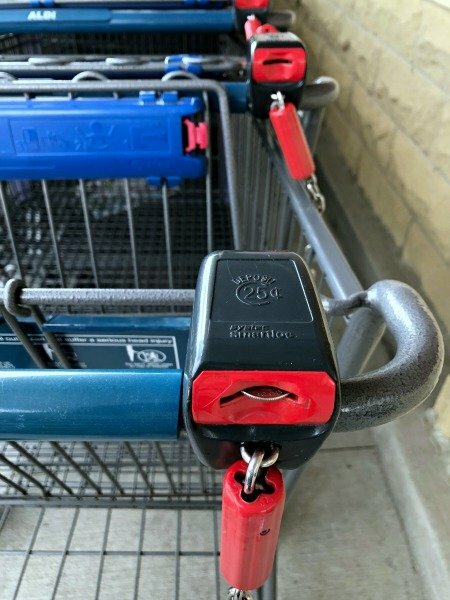 Deposit a quarter to unlock and rent a grocery cart for your shopping trip, then get that quarter back when you return the cart and lock it back up. Keep a quarter in the cup holder of your car so you always have one handy, or pick up one of these cute & handy ALDI quarter keepers on Etsy. Do I have to bring my own bags? You will want to bring your own bags when shopping ALDI, because they don’t provide free grocery bags. You can purchase bags at the register, use one of the empty cardboard boxes they generally set aside near the registers, or bring in your own. You’ll also be expected to bag your own groceries – which, honestly, I prefer since I can bag them the way I want to (and never have issues with items being crushed or meat leaking on produce like I often do at larger chain supermarkets). Your ALDI cashier will scan and place everything in your order right back into your cart, which you’ll then take to a long bagging counter along the front end of the store to bag up your groceries yourself. What’s up with ALDI’s Twice as Nice Guarantee? ALDI offers a Twice as Nice double guarantee on their own brand items: If you’re not happy with one of their products, they will replace the item AND refund your money. Just return the packaging and any unused product to the manager at your local ALDI store. (Note that the double guarantee does not apply to non-food ALDI Finds items, alcohol, national brands, and non-quality related issues.) In all my years of shopping at ALDI I’ve only had to return two items for quality purposes, but had no issues doing so in either case. Can I get groceries delivered from ALDI? In many parts of the country you can now get ALDI grocery delivery through Instacart. Read more about ALDI’s partnership with Instacart and my review of the service. Yes, ALDI does run sales. Each week they’ll advertise meat, produce, and other sales in their weekly ad, which you can view on their website or in their app. Note that sales (and prices in general) can vary by store and by region, so be sure to check the ad for your local store. ALDI also runs seasonal sales — on chips during football season, baking supplies around Thanksgiving, and more. No, ALDI does not accept manufacturer coupons. Very occasionally ALDI will release store coupons for $ off a purchase (for example, during a grand opening or other promotion), but note that they never do release these online. Since most of the items in their stores are their own brand items, manufacturer coupons wouldn’t even generally be applicable, however. What is an ALDI Find? ALDI carries limited time special buy items in their stores each week, also known as ALDI Finds. These are available only while supplies last, and this will be noted on their tags in store (which also appear different than regular sale tags). If you spot an ALDI Find you enjoy, be sure to stock up while it’s available! Some will return seasonally or if they prove to be popular; others may not reappear. See here for more on ALDI Finds — and on how to read shelf tags to determine what is or is not a special buy. ** Sign up for email notifications here! 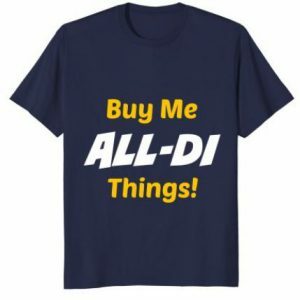 ALL-DI stuff you need to know! Rhonda Eckwall on How did ALDI know I needed this garden cart? Hi! I’m a librarian, blogger, mom, meal planner, ALDI shopper, & recipe creator — and I’m so excited to bring you Almost All ALDI, where we can share our mutual love for America’s favorite discount grocery store. 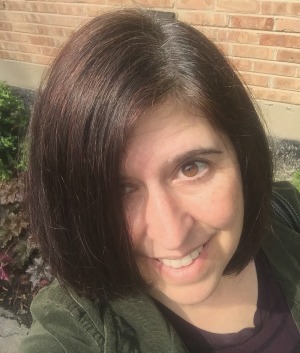 Also be sure to visit sister site Mashup Mom, where I love sharing recipes, meal planning advice, book reviews, foodie tips, and ways to incorporate more real food, realistically! This site is not affiliated with ALDI.